This condition exists when the eye has been damaged and, sight has been lost and the globe of the eye has started shrinking to create a smaller eye with and irregular cornea. Mostly a scleral lens is fitted over such an eye. Another name for a scleral lens is scleral shell or cosmetic shell. Very good results are obtained using a scleral lens. At the age of 18 months my son was diagnosed with PHPV in his left eye, we were shocked as parents and had to make the decision if the eye had to be removed or not. We chose the option to keep the eye. Numerous consultations and yearly MRI scans were performed. At the age of 10 he received a scleral lens but this did not agree with him at all and he was not a happy boy. He was teased and humiliated at school and this really became a problem for him. He is now nearly 17 years old and out of his own he told us he wanted something to be done about his blind eye. He couldn't live like this any longer. About 2 months ago we consulted with Vida for advice as to what we could do to make his life a bit more bearable. She explained to us about a procedure that could be done to make a fitting of a scleral lens more bearable. We went so see Dr Grove for an opinion and the next 2 weeks my son was hospitalised for a conjunctival flap procedure, which would remove the calcifications from his cornea and attach a flap over it. The procedure was done under anaesthetic and after 6 weeks we could return to Danie for a fitting of his new lens. Three days of stress, tiredness but also excitement lay before us. On the 3rd day Danie fitted the lens and to our surprise my son looked absolutely fantastic. We were very emotional as we knew this was a beginning of a new chapter in his life and he will gain much more confidence and feel good about himself. Thank you once again for what you have meant to us and our son. You made a huge difference in his life and we are grateful for everything. We really do appreciate it.
" When I was three years old, I was bitten in my face by an Alsatian . I became a patient of Dr. H Brody and have been for the past 25 years. Originally there was hope for a full recovery, but after a cornea transplant it was discovered that the nerves behind my left eye had been damaged and I would not regain sight in that eye. As I was so young I quickly adjusted, and have never really missed it. After a number of years it was decided to do another cornea transplant for cosmetic reasons. There were a number of small problems after the operation and eventually the cornea was rejected by the eye and yet another one had to be done. This time my eye decided it had had enough, and 'gave in'. What I mean by that is that it had had enough and sunk a bit into the eye socket. No more major operations were advised. All of this happened over a period of about 11 years. Because I had been used to it all my life it never bothered me and I had never got teased by other children (my eye looked a bit like a smeared painting). But by the time I was in high school appearance had become a bit more important to me. I was then told about prosthetic eyes and lenses. I was referred to a doctor who specialized in making these eyes/lenses. She was the only person in the business at that time and her offices were in Johannesburg. She came down to Cape Town, and I went to see her. It was explained to me that I had a choice. They could remove my entire eye and I give me a prosthetic eye, or make a full lens that would cover my whole eye. I opted for the lens as there was nothing wrong with the muscles behind my eye and it seemed less drastic. She took some photos and a mould and went back to Johannesburg to start on it. A couple of months later she flew down to Cape Town again with the end product. It was a strange and alien feeling at first , but with a bit of patience I got used to it. Everyone was very impressed. When eventually this lady married and quit her job, I was referred to Vida Tr?mpelmann. The procedure was slightly different this time. We had quite a few sessions together in which time she fitted and painted etc. The end-product was well worth the time put into it. As I had known nothing else I thought my first lens was perfect, but the second one Vida made was so much more realistic. When I meet new people they don't even know there's a difference between my eyes. Often people will even say things like: 'Are you tired? You're eyes seem red'. It does not place any limitations on my lifestyle and therefore also gives my self-image a healthy boost. It is as comfortable as a contact lens, and I even do scuba diving without any problems. Obviously if I stay up for 24 hours my eye does get tired, but that's only normal. It also involves minimal care and I only rarely visit Vida's for a polish. My three year old loves to give me my 'ogie' (eye) in the morning, she even wanted to wear it the other day! Thanks to Vida I have a perfectly normal life." "She had just celebrated her first birthday. Sand had blown into her eye and an irritation started . She was taken to our GP who then said that we should take her to Red Cross hospital. 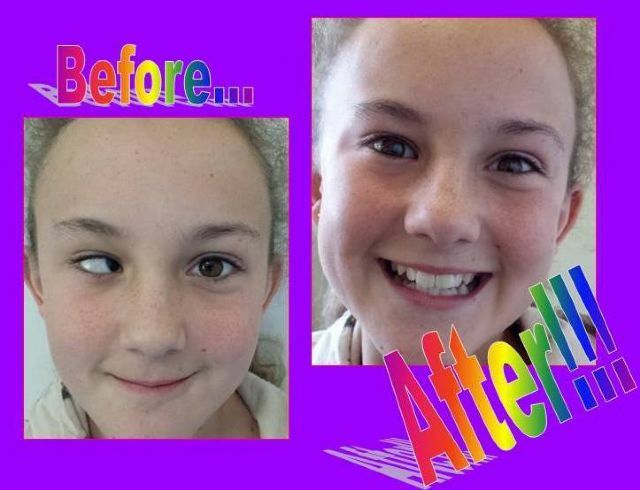 A scan was done at the RCH and to their findings she had inflammation in her eye. She needed to go for an operation at the age of 1 years old. The irritaion had caused a cataract to appear over the pupil of her eye. Since then it deteriorated rapidly. When starting day care kids began teasing her. This made her an introvert and she bacame very unhappy and sad. We heard by work of mouth of Vida Trumpelmann at Red Cross Hospital. We went onto the website and found it very appealing. The website made me anxious, and that is how we got to meet Vida. Since she was given the scleral lens all she wants to do is to look at herself in the mirror. This has made her so much happier and confident about herself. Our heartfelt thanks to Vida and for giving our daughter a second chance and a new perspective to life. I lost my eye when I was 2½; my brother and I were playing with sticks when one accidently went into my eye. I lost my sight but the Specialist was able to reattach the retina in three places which meant my eye did not die. The operation was successful but I had years and years of trouble with infections and my eye pulling squint which made me very self conscious, I would not look at people when I talked to them and would also never call anyone because they would not know who I was looking at. At the age of 22 my mum introduced me to a gentleman in Johannesburg who worked together with an ophthalmic surgeon in Pretoria. I underwent another major operation where they removed all the hardware that was holding my eye together. At that time I had the choice of getting a coral implant or keeping my eye and getting a cosmetic lens, just from the pure pain factor I opted for the lens. After getting many moulds made and my colour repainted a number of times, I have a difficult colour to paint, I got my first lens. I was over the moon and felt like I had a new lease on life. Over the years my socket became more and more sunken making it necessary to get new lenses made. My family and I immigrated to Australia in 2001, I visited Ocularists over here but was not happy with their work and I needed to get a new eye fitted as my socket was looking very sunken. My mum did some investigations in Cape Town and heard about Vida, who had the reputation of painting the best colours. She made an appointment for me and I booked my ticket back. Vida and Danie were absolutely fantastic I had a limited time schedule and what we thought would just be an easy fit turned out to be a very difficult eye to make. The angle of the pupil of my original eye pulls out to the left, which means that to get the direction of gaze of the prosthesis correct is very difficult. The fact that my eye socket had also sunken so badly made it even more difficult as the prosthesis had to be built up in certain places to fill out the socket but that in turn caused my eye lid to not sit correctly. Vida painted my colour which was absolutely magnificent, the iris even had depth to it, it was amazing but we battled and battled to get the shape and direction of gaze correct. Danie and Vida came up with different ideas and never gave up, they could so easily have said that they had done the best they could but they didn’t, they persevered and kept trying different things. My trip came to an end and I left with an eye I thought was perfect but once my eye settled down and relaxed after all it had been through with the models and fiddling the eyelid started sticking and became very uncomfortable. I became incredibly disheartened as I was now back in Australia and how would they be able to fix it from the other side of the world. But they did it, Vida made me three new eyes from the mould that she had and incorporated adjustments we discussed on Skype. She sent me three eyes to try; hoping one would be good enough to wear while I sent her the eye she had made me with the beautiful colour so she could reset it with adjustments. A couple of weeks later I received the best eye I have ever had, I am confident to look at people, it has changed my life. Danie and Vida are the most caring and wonderful people I have ever met, they went all out to make me the best eye possible and I am very grateful to them.